20 A None No Power Seat 20 A is a standard Economy Class seat that may have restricted legroom due to the position of the bulkhead. The proximity to the lavatory and galleys may be bothersome. There is no floor storage for this seat during takeoff and landing. 20 C None No Power Seat 20 C is a standard Economy Class seat that may have restricted legroom due to the position of the bulkhead. The proximity to the lavatory and galleys may be bothersome. There is no floor storage for this seat during takeoff and landing. 20 D None No Power Seat 20 D is a standard Economy Class seat that may have restricted legroom due to the position of the bulkhead. The proximity to the lavatory and galleys may be bothersome. There is no floor storage for this seat during takeoff and landing. 20 E None No Power Seat 20 E is a standard Economy Class seat that may have restricted legroom due to the position of the bulkhead. The proximity to the lavatory and galleys may be bothersome. There is no floor storage for this seat during takeoff and landing. 20 F None No Power Seat 20 F is a standard Economy Class seat that may have restricted legroom due to the position of the bulkhead. The proximity to the lavatory and galleys may be bothersome. There is no floor storage for this seat during takeoff and landing. 20 G None No Power Seat 20 G is a standard Economy Class seat that may have restricted legroom due to the position of the bulkhead. The proximity to the lavatory and galleys may be bothersome. There is no floor storage for this seat during takeoff and landing. 20 H None No Power Seat 20 H is a standard Economy Class seat that may have restricted legroom due to the position of the bulkhead. The proximity to the lavatory and galleys may be bothersome. There is no floor storage for this seat during takeoff and landing. 20 K None No Power Seat 20 K is a standard Economy Class seat that may have restricted legroom due to the position of the bulkhead. The proximity to the lavatory and galleys may be bothersome. There is no floor storage for this seat during takeoff and landing. 21 G None No Power Seat 21 G is a standard Economy Class seat however, the proximity to the lavatory may be bothersome. 35 H None No Power Seat 35 H is a standard Economy Class seat however, the proximity to the lavatories may be bothersome. 35 K None No Power Seat 35 K is a standard Economy Class seat however, the proximity to the lavatories may be bothersome. 62 G None No Power Seat 62 G is a standard Economy Class seat however, other flyers tend to bump into this seat. 64 A None No Power Seat 64 A is a standard Economy Class seat in the last row of the aircraft whose proximity to the lavatory may be bothersome. 64 C None No Power Seat 64 C is a standard Economy Class seat in the last row of the aircraft whose proximity to the lavatory may be bothersome. 67 D None No Power Seat 67 D is a standard Economy Class seat however, the proximity to the lavatory and galley may be bothersome. 68 D None No Power Seat 68 D is a standard Economy Class seat in the last row of the aircraft whose proximity to the lavatory and galleys may be bothersome. 68 F None No Power Seat 68 F is a standard Economy Class seat in the last row of the aircraft whose proximity to the lavatory and galleys may be bothersome. 68 G None No Power Seat 68 G is a standard Economy Class seat in the last row of the aircraft whose proximity to the lavatory and galleys may be bothersome. 7 A None No Power Seat 7 A is a standard Business Class seat however, the proximity to the galleys may be bothersome. 7 D None No Power Seat 7 D is a standard Business Class seat however, the proximity to the galleys may be bothersome. All seats on this aircraft have access to an AC power port. Wi-Fi connectivity is available for all passengers aboard this aircraft. The SriLankan Airlines Airbus A330-300 is primarily operated on medium and long-haul routes. This A330-300 features a two class configuration with 28 flat bed Business Class seats and 269 standard Economy Class seats. Cabin crew, food and all amenities very good, however, this probably applies to all the seats: 1. Foldaway table is small & when deployed, not close enough to your body. 2. Rise/fall armrest at its highest is next to useless as too low and too far away! Forward toilet cubicles, are very cramped. In general the business class section is excellent BUT seats 1D and 1G are badly impacted by the galley. There is a poorly aligned cupboard which means that the trolleys and passengers passing by bang into your legs. Ive been in this site 4 times already this year and its NOT good!! Both business and economy class seats are very comfortable. Best hard product in business coupled with top-notch service make SriLankan a no brainer when you can get the A330-300. Not a bad seat in business in my opinion. Obviously if you're alone try to get window seat, if a couple go in the middle together. Found the seat as comfortable as expected for business class. The herringbone layout is highly practicable and provides reasonable privacy. Layflat for long haul is a real boon. Cabin staff the best I personally have come across. UL504 seat 2K LHR-CMB & UL503 2A CMB-LHR. More than satisfied with inflight service/ food/liquids. Would agree with previous comments on the lack of storage in the immediate seat area. Seats 1D/G are impacted by gallery access. Poor choice of videos. A few years since I had flown SriLankan & this craft is a vast improvement. Great business class seat.Fully flat.Wide enough to turn around to the side when sleeping. 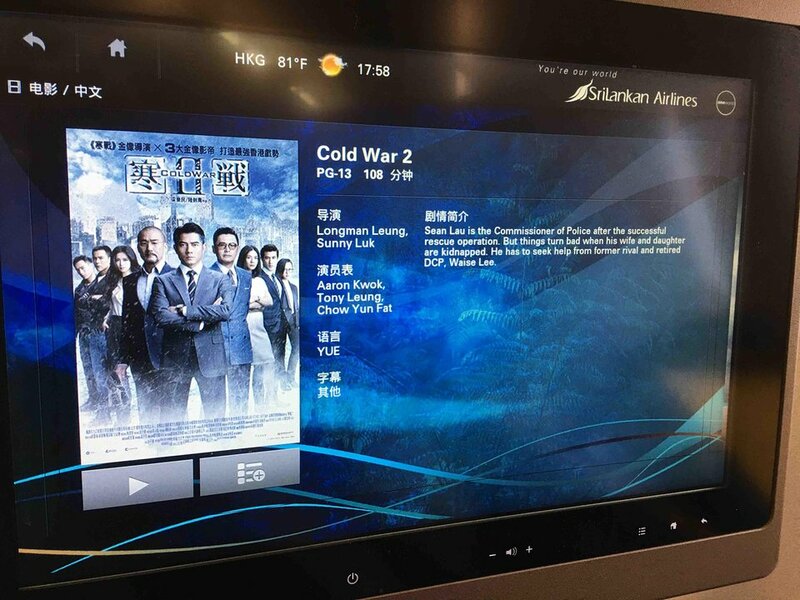 Ife was good, except it need to have more recent english movies and other international movies. No duvet was provided. Food was good. Service was good too. Enjoyed my flight to Frankfurt. Having recently flown A330 300, Business Class, to, and from, Colombo I was very surprised at the small amount of storage space in the seat area. There was more usable storage space in the seating area of the A330 200 of the flight to Male! The only saving graces were the overhead locker and the superb cabin crew! Firstly, there was no bothersomeness with the vicinity of the galley or the latrines and secondly, the seats are sufficiently far forward to not be restricted by the bulkhead. The back row is also numbered 65 and not 66 as on the diagram. 65K is even better and you dont get kicked in the back by kids behind you. Really good seats. Seats 65 DFG and 66 DFG are reserved for flight crew on long haul flights and are curtained off. 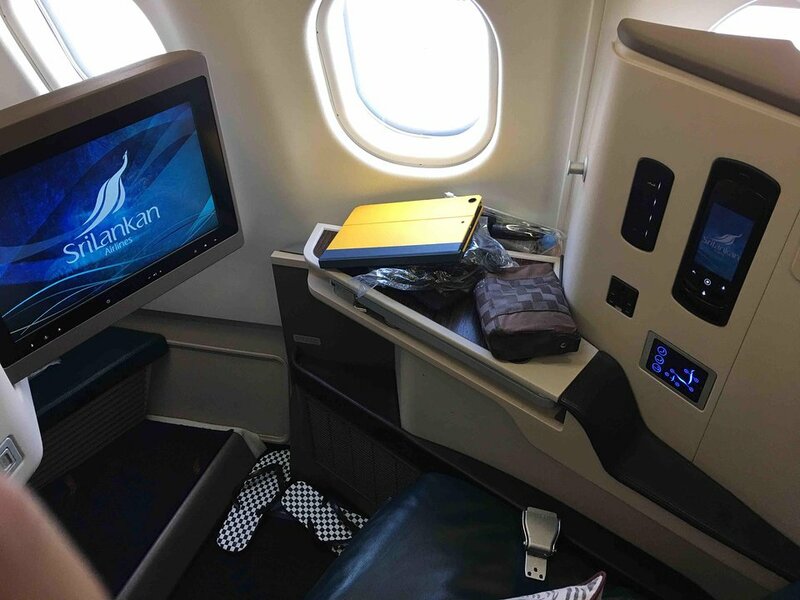 SriLankan Airlines flies 1 versions of Airbus A330-300.